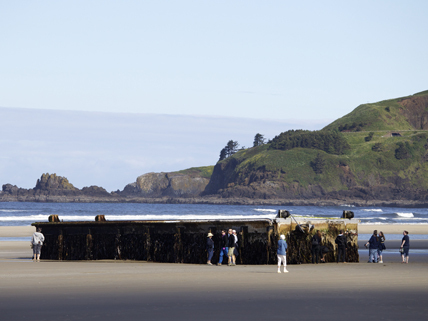 This dock floated all the way across the Pacific Ocean to land on an Oregon beach. The beautiful Pacific Ocean is already sullied by the “great Pacific Ocean garbage patch,” a vast region where floating plastics and other trash have collected. Now faces a new peril—debris swept out to sea by the tsunami that devastated northeast Japan in March 2011. Of the 5 million tons of debris that the tsunami ripped from the Japanese coast, 1.5 million tons are still adrift. Some of it is coming our way. Original predictions of how ocean and wind currents would carry the debris estimated it would reach Hawaii some time this winter. Many items have already arrived, however, along North America’s west coast, especially in Alaska and the Pacific Northwest. Among them are a soccer ball, a motorcycle, chunks of wall insulation, fishing nets, and plastic buoys. An entire 70-foot-long dock came to rest on a beach. The U.S. Coast Guard had to sink a “ghost ship” that came uncomfortably close to Alaska. The Japanese fishing boat was endangering maritime traffic and could have caused environmental pollution if it had run aground. Other objects pose different environmental threats. One Alaskan environmentalist pointed out that entire communities went into the sea. He compared the trash to all that is stored in a typical American family’s garage. Leaking oil canisters and containers of household and industrial chemicals can foul water and damage coral reefs. Because the debris is spread over a wide area instead of in one connected raft, ships are in danger of crashing into unseen large objects. In addition, people who pick up sharp objects or hazardous chemicals from the beaches could be injured. Some dangers are less obvious. Marine organisms that have attached themselves to floating items could be invasive and harm native species. There is one piece of good news, though. The chance of radioactive garbage arriving on our shores is very low. Destruction of the Fukushima Daiichi nuclear power plant occurred after most of the debris had already washed away. Get an overview of the problem, along with predictions for the future. This NOAA site provides an FAQ page, graphics, updates, a list of events, and other resources related to the tsunami debris. Under Additional Resources, find special information for Oregon and Washington residents. Check out the animation that shows how ocean currents collect floating garbage; includes links to a virtual tour of the garbage patch. This story includes photos of items that have already washed ashore. Among them is a motorcycle that has been traced to its owner in Japan. Climate changes do not cause eakhtquares and tsunamis. They are natural, unavoidable disasters.Similarly there would be no climatic change happening due to eakhtquares and tsunamis.There is only devastation, property and human loss. But nothing to do with climate.If the question is specific to Japan, She might be talking of that Nuclear Reactor blasts, Volcanic blasts and petroleum refinary that caught fire. Even in that case there is no significant climatic change. There is only Environmental pollution. So be specific with words and terminology used. We should sue the Weather Man.